Jayhawks.com is a service of KUHistory.com , brought to you by the KU Memorial Unions. We hope you find the site interesting, entertaining and useful. Give KU collectors special opportunities to further their hobby. What can I find on Jayhawks.com? 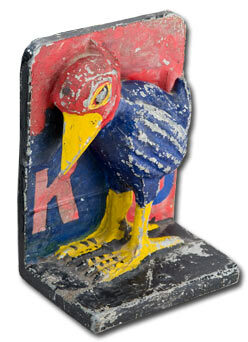 The featured part of the site is the Jayhawk Collection at the Kansas Union. The collection includes over 1,000 pieces of KU memorabilia. Check the links on the left for other collections and traditions information. Do you have a special piece you would like to donate to the collection? Contact Mike Reid, Director of Public Affairs at the KU Memorial Unions at kuhistory@ku.edu.